Is Agents of SHIELD Season 2 Good? Episode 1 Review! Unlike Gotham which debuted to a fresh, adoring public this week, Agents of SHIELD season two aired last night with a lot of baggage. Season one certainly has its fans, but the general consensus seems to be: Not a very good show, but it got a LOT better after Captain America 2 and the dissolution of SHIELD at the hands of Hydra. I tend to agree, and although I have my own plan for the Season 2 I want to see, I think Agents of SHIELD S2 episode one was able to match the potential exhibited by Gotham in its pilot. So far these are both comic book TV shows defined by potential, and with an entire season under its belt AoS certainly has a shorter forgiveness-leash. Nonetheless, episode one puts season two on the right track. Please Note that the below observations may contain spoilers. Mostly no, but if you haven’t seen the episode, come on back later. There’s a lot that went into a generally strong opening episode – an interesting portrayal of a bonafide Marvel heavy, the Absorbing Man, and a second half with genuinely dark plot twists – but for me the key big picture element is that Agents of SHIELD knows its role now. Whereas the first 16 episodes of season one just had Agent Coulson and his team of attractive undergraduates flying around looking for fancy artifacts, season two has actual focus and purpose. Agent Phil Coulson is now Director Coulson, leading the post-Nick Fury SHIELD, and forced to operate in the shadows by a world that now hates and fears SHIELD. Not only does this provide focus for Agents of SHIELD as a show, but it offers contextual relevance within the Marvel Cinematic Universe. It’s only within the walls of Agents of SHIELD that we can see the continued fallout of the HYDRA infestation revealed in Captain America: The Winter Soldier. General Talbot (nod to all the Hulk and Heroes fans out there) is the public face of a military hunting down rogue SHIELD agents, attempting to reign in these vigilantes who think their mission to protect grants them unrestricted privelage. To the public, SHIELD and HYDRA are virtually the same thing; mysterious organizations with far too much power that threaten humanity. This is the scene Director Coulson enters. The renewed assertion that Agents of SHIELD is a part of the Marvel Cinematic Universe – and more importantly a part that matters – is a wonderful development and pays off immediately. First we see Agent Carter, Dum Dum Dugan and the Howling Commandos raiding the last remnants of the Red Skull’s Nazi HYDRA operation, in what is undoubtedly the strongest lead to any single AoS episode to date. (It also has me extremely excited for the mid-season jump to Agent Carter – I fully expect that to be our strongest non-CW comic book TV this season.) From there, we see the new status quo of a SHIELD in the shadows, with Skye, Melinda May and an assorted crew of new mercenaries running stealth missions in the interest of securing dangerous tech and personal. This all flies off the rails as the Absorbing Man kills our SHIELD contact (and takes several bullets to the chest without any powers seemingly absorbed… guess he absorbs the speeding bullets??) and Coulson and the team find a connection to a long-last Red Skull weapon of mass destruction. Just like that we’re off, but look at all the Marvel Universe goodies tied into that plot reveal. Red Skull, HYDRA, the Howling Commandos, the Absorbing Man… my goodness it’s practically a comic book! Even better, the Marvel U inclusions are relevant to driving the story – something that can’t be said for the overly reference-heavy Gotham pilot (hey look it’s Poison Ivy as a preteen everybody!). 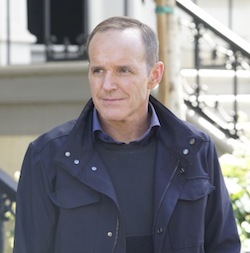 I also much prefer Director Coulson, still new to the job but already applying some of Fury’s espionage and covert operations as he attempts to outmaneuver both HYDRA and the United States military. The moment where he takes note of the World War Two artifact and reveals Director level clearance background knowledge is key. Part of what makes Nick Fury so cool is that he knows just about everything about everything (a big reason why he plays such an integral role in Marvel’s latest event, Original Sin). These are enormous shoes for Coulson to fill, but it’s a good sign to see him starting to slip into them a little more comfortably, rather than the tortured and aimless agent we saw in season one. Even Skye and Ward’s reunion was pitch perfect. I may have called for this exact scene minus letting Ward do any talking in my Season two pitch (can you call it a pitch if you don’t pitch it to anyone? ), but the scene was surprisingly interesting. Brett Dalton got to show off some range in his third iteration of the traitor Ward, now a contemplative and repentant prisoner in a SHIELD prison similar to Loki’s in Thor: The Dark World. And then there’s Fitz and Simmons. Last we saw the sweetest pair on the show, Fitz was sacrificing himself to save Simmons life from the depths of the ocean after Ward sent them plummeting to their demise. They’re back in the lab now, and while I won’t spoil the specifics, the choices on how to handle Fitz are the boldest, most heart-wrenching moves the writers of Agents of SHIELD have ever made. SHIELD hunting HYDRA – The show appears to be heading this direction with the HYDRA presence in World War Two, Ward hanging around, and the ending realization that HYDRA didn’t dissolve, they just took to the shadows (presumably with twice as many heads). Nonetheless, I really want Agents of SHIELD to hang on to HYDRA as the focus for the team. Last season was too frequently just putting out unpredicted fires – let’s have season two be more of a focused hunt. Make the Dark Stick – Episode one took some dark turns towards the end, some of which were genuine stomach punches. Here’s my hope: no easy answers. I can’t imagine Agents of SHIELD introduced Lucy Lawless only to leave her a crumpled heap under the Absorbing man’s automotive assault (particularly after she asked her partner to CUT OFF HER ARM), but I’m hoping we can avoid the episode two intro where she’s in a hospital bed and somehow basically just ok. We’ve already introduced Deathlok’s in Agents of SHIELD, and remember this is a character holding an artifact of unknown potential; couldn’t that hold some secrets to a sudden transformation? Lots More Absorbing Man – There’s no doubt Crusher Creel will be back on an episode of Agents of SHIELD, but the show does have the choice between featuring him as a powered piece of unexplained muscle and actually giving us an origin and some time with good ol’ Crusher. 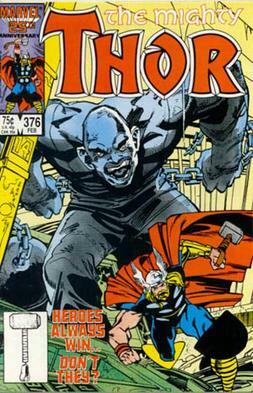 In the comics, Creel is given his Absorbing Man powers by Loki in one of the trickster’s schemes to vex Thor. I don’t expect a one for one match, but we have featured Asgardians on Agents of SHIELD before so there’s no reason Creel’s origins couldn’t feature some Norn stones. Just Answer the Skye Dad Mystery – I’m still pulling hard for a serial killer Inhuman, but I think I speak for every Agents of SHIELD fan when I say this mystery just needs to be answered. Dragging it out will only remind us of season one, and that’s not progress. Kraken And a HYDRA Cabal – Ok… so at the end of the episode, the big reveal is that the Nazi from the opening sequence is still alive, well, and pulling strings from within HYDRA. It’s also revealed that his name is Daniel Whitehall, aka The Kraken from Jonathan Hickman’s tremendous Secret Warriors comic. Literally anything from the pages of Secret Warriors is a great move by Agents of SHIELD, and while certain members of the evil spy Cabal won’t be surrounding the Kraken (Viper for example seems to be a part of Fox’s X-Men rights), I’m hoping for additions like the Gorgon, Zodiac, and of course, Baron Wolfgang Von Strucker!